The Pitt men’s basketball team continued its trend of poor play late in games Wednesday night at Miami. As in their previous two contests, the Panthers held a lead in the latter part of the second half, but they failed to maintain that lead and fell to the Hurricanes, 69-57. With Miami’s (16-5 overall, 5-4 ACC) most productive player, sophomore guard Bruce Brown Jr., out for six weeks with a recent foot injury, the time seemed ripe for a potential Pitt upset — especially considering that the Panthers (8-15 overall, 0-10 ACC) knocked on the door in their two previous ACC matches, losing to NC State, 72-68, and Syracuse, 60-55. The Panthers kept it close for much of the contest, but once again they faded down the stretch. Miami dominated its opponent on the boards collecting 39 rebound to Pitt’s 24 as Pitt fell in its 10th straight ACC game. Pitt struggled on offense early on, and it looked like the game may have been trending toward a blowout. The Panthers scored just nine points through the first 12 minutes of game time and fell behind to the Hurricanes, 21-9. The Panthers finally broke the double-digit barrier with seven minutes remaining in the first half when junior guard/forward Jared Wilson-Frame knocked down a three. Still, Pitt continued to struggle and fell behind by as many as 15 points. The Panthers refused to allow the deficit to grow any further and mounted an 8-2 run in the final four minutes of the first half. Wilson-Frame and first-year guard Marcus Carr were instrumental in the comeback effort, accounting for all eight points as the Panthers narrowed the deficit to 34-25 entering halftime. At the half, Carr and Wilson-Frame led the Panthers in points with nine each. 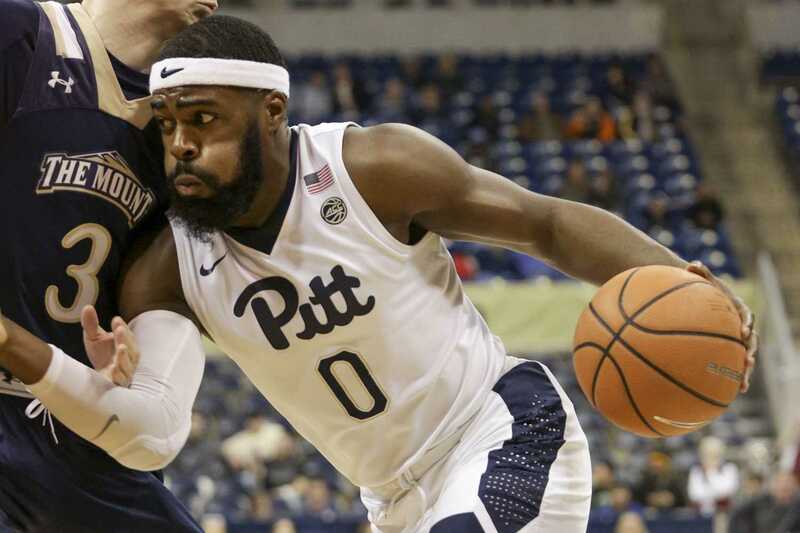 The first half displayed Pitt’s reliance on 3-point shooting, as the Panthers scored 15 of their 25 points on five-of-12 shooting from beyond the arc. The two teams more or less traded buckets to open the second half, with Pitt unable to close the deficit and Miami unable to broaden it. The difference remained the same after seven minutes of action, with the Hurricanes leading 43-34. The Hurricanes went ice cold and the Panthers began to find their shooting stroke over the next three minutes. Pitt quickly went on a 10-0 run led by Wilson-Frame and first-year guard Parker Stewart, who each hit a 3-pointer. The Panthers took their first lead of the game, 44-43, with 10 minutes remaining. Pitt’s momentum ended abruptly. As the saying goes, “live by the three, die by the three” — well, the Panthers took the lead by nailing threes, but they would go ice cold from long distance for the remainder of the game. Miami proceeded to go on a 14-2 run over the next six minutes, securing a decisive 57-46 lead with five minutes left in the game. Wilson-Frame and Carr each knocked down a three in the final minutes, as the duo did all they could to keep Pitt in the game. But the Panthers failed to muster any significant defensive stops, and the Hurricanes secured a 69-57 victory. Wilson-Frame finished as Pitt’s leading scorer with 17 points — 15 of which came from three-pointers — followed by Carr with 14. The Panthers’ next chance to right the ship will come on the road against North Carolina Saturday, Feb. 3 at 8 p.m.